Home » Nature » Notable Diamonds. By Sparky in Nature on June 19, 2009 . These days, it’s a big deal when celebs like Jennifer Lopez and Katie Holmes get six and five-carat diamonds in their engagement rings (respectively). But compared to these 10 gems, those trinkets are nothing. Here are the stories behind some of the largest and rarest diamonds ever found. 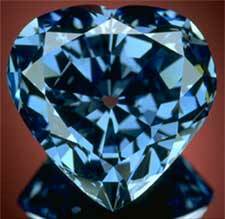 This Titanic-esque vivid blue diamond is 30.82 carats. It’s called the Eugénie Blue because of an old legend that the sparkly stunner originally belonged to Empress Eugénie de Montijo, the wife of Napoleon III. There is no evidence to support this tale, though, so many people prefer to simply call it “The Blue Heart” instead. The gem was cut into its distinctive shape in 1909 or so (some accounts say it was 1910) and was bought by Cartier shortly thereafter. Since then it has bounced around from a wealthy Argentinian woman, Van Cleef and Arpels, a European family, Harry Winston, Marjorie Merriweather Post, and, finally, the Smithsonian, where The Blue Heart has resided since 1964. 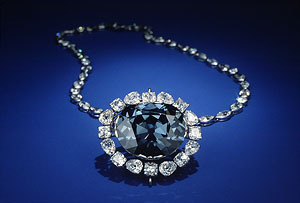 And although it may look like it inspired the fictional Heart of the Ocean from the 1997 Leonardo DiCaprio epic, it didn’t – the Heart of the Ocean was actually based on the infamous Hope Diamond. 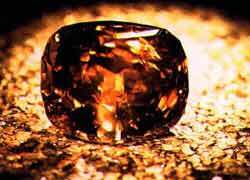 Cullinan I, AKA the Star of Africa, is 530.20 carats and resides in the Sovereign’s Royal Sceptre. Cullinan II, AKA the Lesser Star of Africa, is a bit smaller at 317.40 carats and is mounted in the Imperial State Crown. Cullinan III is a 94.40-carat pear-shaped diamond that can be mounted in Queen Mary’s Crown or worn with the Cullinan IV as part of a pendant. Versatility is so important, don’t you agree? Cullinan IV, 63.60 carats, can either be part of the pendant or set in Queen Mary’s Crown as well. Cullinan V is a measly 18.80-carat triangular-pear cut diamond and can either be in a brooch or mounted in the circlet of Queen Mary’s Crown. The Koh-i-Noor diamond (coming up on the list) used to be set in that spot, but when it was later moved to another crown, the Cullinan V took its place. Cullinan VI is sometimes worn by Queen Elizabeth II as part of an emerald and diamond necklace. I suppose at 11.50 carats, it’s less ostentatious than some of the others. 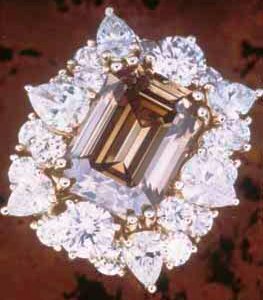 Cullinan VII and Cullinan VIII have been combined into an all-diamond brooch. Cullinan IX, coming in at 4.39 carats, is worn by Queen Elizabeth as a ring. As far as we know, this beauty is the world’s largest flawless Canary Yellow diamond. 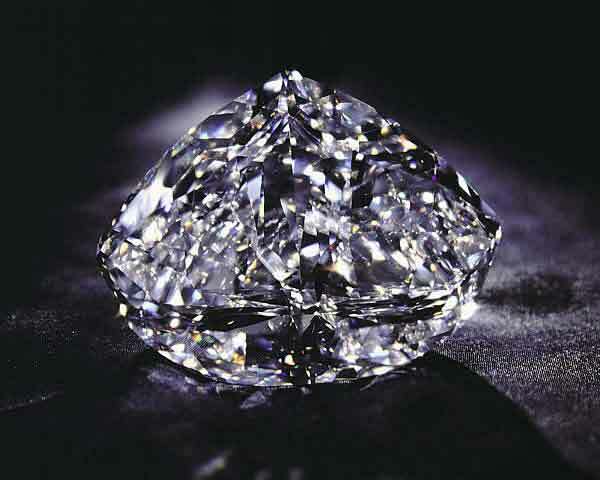 For quite a few years it remained in its original uncut 124.5-carat state. This particular type of diamond – a fancy intense yellow – accounts for less than 0.1 percent of all natural diamonds, so you can imagine how rare one this size is. The gem was cut to a still-huge 43.51 carats and somehow became entangled in a drug dealing and money laundering ring in Ohio, which was busted in 2006. As a result, the unusual jewel became property of the U.S. government. Just as of May 11, 2009, it was declared that the Golden Eye diamond belonged to the government, and in turn, the government announced that it would be auctioning the diamond off. 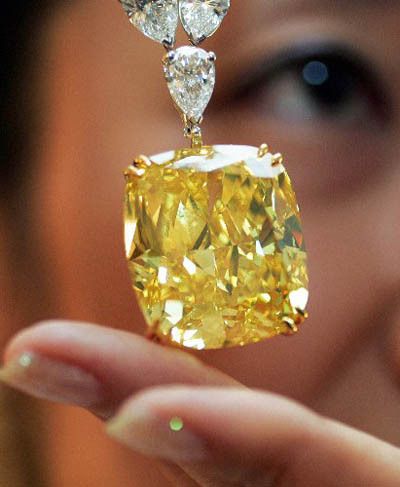 So if you’re looking for a rare yellow diamond in the neighborhood of $15-$20 million, keep your eyes peeled! 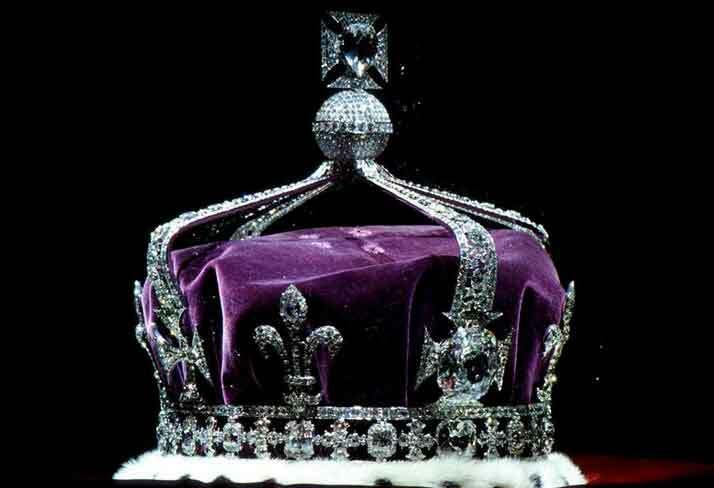 The Kohinoor has a long, storied history and, according to some legends, is more than 5,000 years old. We know for sure it has been around since at least 1526, which is the first time it was identified by name in writing. For hundreds of years it was in the possession of various Indian Emperors and was even installed into the Peacock Throne of Mughal Emperor Shah Jahan (the guy responsible for the Taj Mahal). But in 1851, it was decided that the bauble would be presented to Queen Victoria, who immediately put it on display at the Crystal Palace Exhibition. After people expressed disappointment at the famous diamond’s lack of brilliance, she ordered it to be recut for a better display. After it was cut down by about 80 carats to its current 108.93 size, the diamond was moved from a tiara to the centerpiece of the Queen consort’s crown (used by both Queen Alexandra of Denmark and Queen Mary of Teck) and finally to Queen Elizabeth the Queen Mother’s crown in 1936. 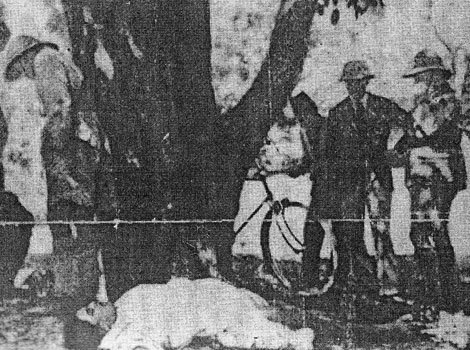 It remained there until her death in 2002 and was set in the Imperial State Crown afterward. It’s probably best that it’s now locked up in the Tower of London, because there is supposedly a curse upon it that says, “He who owns this diamond will own the world, but will also know all its misfortunes. Only God, or a woman, can wear it with impunity.” Do you think it’s a coincidence that only female members of the Royal Family have worn the gem? 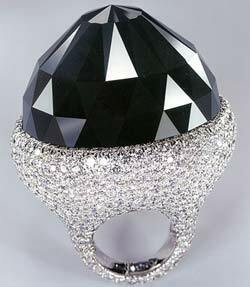 The largest cut black diamond in the world is also the world’s fifth-largest diamond of any kind, weighing in at 312.24 carats. It was 587 carats before it was cut. The Spirit of de Grisogono is set in a ring that contains 702 white diamonds and is thought to have been sold to a private collector. When this huge sparkler was found at a South African De Beers mine in 1967, it was a whopping 248.9 carats. As you can imagine, it caused quite the stir in the industry, and not just because of its massive size. It was actually the color everyone was talking about: The Earth Star was brown. The Baumgold Bros. jewelers bought the enormous jewel and cut it into a pear shape that ended up weighing 111.59 carats, which was the largest brown diamond in the world at the time (it’s still the third largest brown diamond… we’ll get to the largest in a minute). It was Baumgold that gave the diamond its name. For more than 15 years, the Earth Star traveled the world in various exhibitions, but it was bought by a private citizen in 1983 for the staggering sum of $900,000. Sure, the Golden Jubilee is widely celebrated now – it’s the largest faceted diamond in the world. But when it was first discovered in 1985, people in the industry refered to the 755.5 uncut rock as “The Unnamed Brown” and “The Ugly Duckling.” Since it was kind of homely, De Beers decided to let jewel cutter Gabriel Tolkowsky try an experimental method of cutting using some untested tools. They figured if he messed it up, it was no great loss – the thing was going to be unmarketable anyway. Under Tolkowsky’s hands, though, the Ugly Duckling turned into an amazing yellow-brown diamond of epic proportions. It was presented to the King of Thailand for his Golden Jubilee in 1997, which is when it finally received an appropriate name. It’s still a part of the Crown Jewels of Thailand today. The Ocean Dream may be small – a mere 5.51 carats – but it’s the only diamond in the world of its kind. 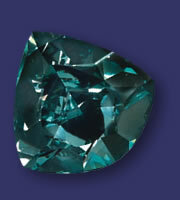 No other diamond is known to naturally possess a blue-green hue like this one. The color is thought to have come from being exposed to natural radiation in Central Africa for thousands of years. It’s currently owned by the Cora Diamond Corporation, but you might have seen it at the Smithsonian as part of “The Splendor of Diamonds” exhibit a few years back. Of course, no article about notable diamonds would be complete without mentioning the Hope. This 45.52 fancy deep blue diamond is gorgeous, to be sure, but also deadly – at least according to some. The Hope’s story starts with the Tavernier Blue, a crudely cut triangular stone of about 115 carats that was sold to King Louis XIV in 1669. Several years later, Louis had the stone cut down to about 67 carats and had it suspended on a gold ribbon so he could wear it on formal occasions. He renamed the new cut the “French Blue.” In the mid 1700s, Louis XV had the gem set into a pendant and it was much speculated that Marie Antoinette wore it; the curse is the reason she was beheaded. Not so, say most historians: there’s no evidence that it ever adorned the doomed Queen. The French Blue mysteriously disappeared in a jewel heist in 1792 and never turned up again. However, the Hope Diamond suddenly arrived on the scene just as the statute of limitations on the jewel heist was running out 20 years later. It happened to be the exact same color as the missing French Blue, although it had been cut differently and was decidedly smaller. The Hope had several British owners throughout the 1800s, although, surprisingly, it never came into the hands of the Royal Family. By 1910, famed jeweler Pierre Cartier had acquired the blue beauty and sold it to American socialite Evalyn Walsh McLean. She wasn’t interested until he reset the old stone in a modern setting and told her tales of the curse. She wore the stone for 37 years (and often let her dog wear it around the house as well) and left it to her grandchildren upon her death in 1947. However, she was quite in debt, and her trustees ended up selling it in order to pay of some of the money she owed. 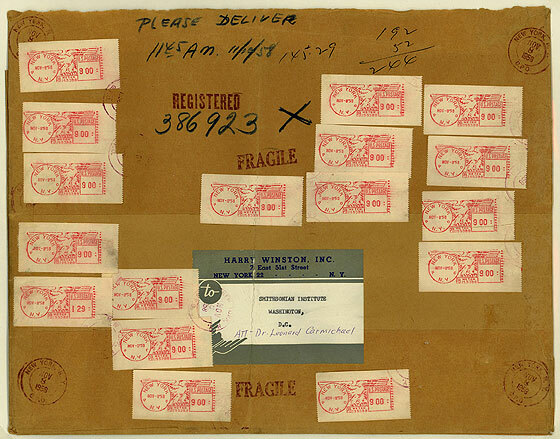 That’s how Harry Winston ended up owning it until 1958, when he decided that it belonged to the Smithsonian and sent it there in an uninsured brown paper envelope. It’s still part of the Smithsonian today, and so is the envelope (that’s it above).